At Cosmedics Dr Lalloo has over 18 years’ experience with fillers and has done more in that time than practically anyone in Europe. Dr Lalloo feels that the best lips and fillers are the ones that just look great not filled and shapeless. Dermal Fillers (Hyaluronic Acid) provides fuller and shapelier lips. Over time our lips can lose definition and fullness. Dr. Lalloo is highly skilled at providing the right results for you whether it is subtle definition or an increase in volume. 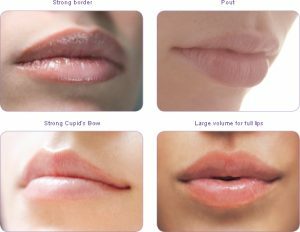 Results from lip fillers are visible immediately, some swelling will occur from the treatment which settles after one week. Treatment results will vary from person to person. Lips / cheeks under eyes and other areas all filler dissolved in 24-48 hours with no pain. Lumps in the lips / uneven filler fixed. With most common hyaluronic acid based fillers Dr Lalloo uses an enzyme called hyaluronidase to dissolve the unwanted dermal filler, sometimes it can take two appointments. We can refill the area if wanted after a week or so. In Ireland beauticians and even hairdressers are offering below standard fillers to people who just do not know any better and often they are left with deformed looking lips and swollen faces. We are here to help and will expertly remove the filler in a painless and quick way allowing you to return to normal.